PROPERTY developer SP Setia Bhd today launched its first low-cost housing scheme in Bandar Setia Alam flagship development in Shah Alam. President and chief executive officer Tan Sri Liew Kee Sin said a total of 120 acres had been set aside for low-cost homes comprising 7,212 units. The low-cost scheme will be built in phases and 449 units are now being offered, he said. The project comprised five-storey and six-storey walk-up apartments with a built-up area of 682 sq ft, Liew said. "We have a long list of customers wanting to buy. Once we get approval from the ministry, we will call them," he said at a media conference after the launch. The project launch was officiated by Housing and Local Government Minister Datuk Seri Kong Cho Ha. Kong also witnessed the signing of a memorandum of understanding between SP Setia and Malaysia Building Society Bhd on the 100 per cent financing for Setia Alam's low medium-cost homes. Development of the low medium-cost housing will comprise 220 units of five-storey walk-up apartments with a built-up area of 800 sq ft and these are targeted for launch next month. Liew said that SP Setia's 5/95 Home Loan Package, which was launched on January and expired last month, has been extended until July 19. "Our target for the next three months is RM300 million," he said. 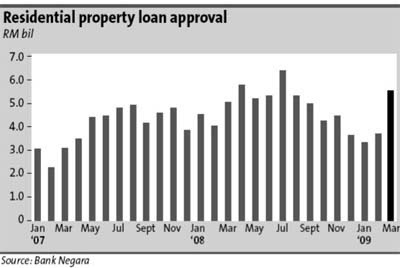 The home loan package allows buyers to pay only an initial five per cent of the price of the house. All legal fees and stamp duty on the sales and purchase agreement will be borne by SP Setia. KUWAIT Finance House (Malaysia) Bhd (KFH) is considering the possibility of investing in property development projects in Australia, says its director for real estate advisory, Siti Mariam Mohd Desa. "We are still considering the venture and have received a few invitations. We are looking at mixed-development projects and Australia is stable in terms of investment," she told reporters after the Pavilion residences key handover ceremony in Kuala Lumpur today. Siti Mariam said that KFH had already participated in a few property development projects in countries like Singapore, China and Malaysia. "The few projects in Malaysia are mostly located in the Kuala Lumpur City Cente (KLCC)and other areas like Sunway Quay in Selangor and in Penang. "Property prices in Malaysia are generally lower," she added. On the Pavilion Residences, Urusharta Cemerlang Sdn Bhd chairman Tan Sri Zainol Mahmood said it was an exclusive world-class apartment complex, with a gross development value of about RM600 million. The Pavilion Residences are located within the Pavilion Kuala Lumpur integrated development. It is six-star luxury residences comprising 368 units across two towers, ranging from studios, one to four bedroom units, duplexes and a penthouse. The four-bedroom units were sold at over RM4 million each and the penthouse at an impressive price of RM15 million. The tower two has been sold to purchasers from over 18 different countries including Australia, Bahrain, Canada, England, Hong Kong, Japan, Italy, Malaysia and Mauritius. KFH sold the Pavilion Residences Tower One to IMMO Pavilion, a local holding company that is part of the IMMO Portfolio Target Fund managed by SEB Asset Management, one of Europe's largest real estate fund managers. KFH was the former equity partner of Urusharta Cemerlang, holding a 49 per cent stake in the entire Pavilion Kuala Lumpur integrated development. The Qatar Investment Authority has since acquired its share. BINA Goodyear Bhd (BGB) said its wholly owned subsidiary, Greater Heights Development Sdn Bhd is proposing to dispose a piece of land to Green Heights Development Sdn Bhd for RM27 million cash. This will bring immediate financial benefits, ie interest savings on bank borrowings of approximately RM697,500 to the group as well as provide additional funds for its construction and future opportune investments. KUALA LUMPUR: The A(H1N1) influenza epidemic has “infected” the real estate industry, taking the International Real Estate Federation (Fiabci) as its latest victim. The 60th Fiabci (International Real Estate Federation) World Congress that was to be held from May 19 till May 23 at the Beijing Hotel in Beijing, China has been called off at the eleventh hour. More than 600 Fiabci members from around the world had been expected to attend the Congress this year. The Chinese government, host to the Congress and the organising committee led by the China Real Estate Association, cited concerns over the spread of the A(HINI) flu pandemic as the reason for the decision. Fiabci Asia Pacific secretary-general Kumar Tharmalingam, when contacted by The Edge Financial Daily, said Fiabci chapters around the world had been informed of the move to call off the Congress by the host city just three days before the Congress. “Some of our members have already flown into the capital ahead of the congress. We were surprised by the move that came so close to the date of the event. “The host offered to compensate delegates and suggested that the Congress be postponed to a later date after the A(H1N1) epidemic is cleared but we have not decided on that,” said Kumar. In a letter of apology to registered delegates, the organising committee said it took only one suspected case of A(H1N1) from among the delegates to affect the entire Congress. Hence, “to ensure the health of all the delegates, their families and accompanying persons as well as the quality of the congress, we proposed to postpone the congress,” it stated in the letter. Delegates were to have witnessed the installation of Lisa Kurass, chairman of the Real Estate Connection International, a property management and real estate brokerage company based in Houston, Texas as Fiabci World’s first female president. Replacing Luis Fernando Correa Bahamon of Fiabci Colombia, Kurass was elected to the top post in June last year and was slated to assume the position at a ceremony in Beijing. A number of Fiabci members from the United States would have flown in to witness this historical event. The transfer of the presidency will now be carried out during one of Fiabci’s board of directors’ meeting. Another highlight of the Congress was to be the Fiabci Prix d’Excellence Awards 2009 presentation ceremony on May 21. “We will now announce the winners of the Awards in the media and winners can arrange to have their own private presentation ceremonies,” said Kumar. Last year’s Prix d’Excellence Awards saw Mulpha International Bhd coming out top in the Residential Category for its Pinggiran Bayou Village Homes, part of its Leisure Farm Resrt development in Johor, while four other Malaysian developers the clinched runner-up positions. According to the World Health Organisation (WHO), as of May 17, 39 countries have officially reported 8,480 cases of the A(H1N1) influenza infection. WHO has not recommended travel restrictions related to the outbreak of the influenza. The Paris-based Fiabci is a global organisation of real estate associations in 60 member countries and is affiliated with the United Nations. KUALA LUMPUR: Over 3,000 Asian and international real estate professionals are expected to gather and discuss issues affecting real estate investment and development in Asia at Cityscape Asia 2009 which begins on May 19 in Singapore. Held over three days until May 21 at Suntec Singapore, the forum aims to assist the real estate professionals in sourcing new investment opportunities and meeting potential clients. Dubbed Asia's premier international real estate investment and development event, it has attracted property-related stakeholders such as property investors regionally and internationally, real estate developers, architects, property consultants, government and professionals involved in the real estate industry. Participants can take part in several open discussion forums, lucky draws, roundtables such as the "Iskandar Malaysia Investor" roundtable and "Vietnam Investor" roundtable and various project showcases from developers including Malaysia's Naza TTDI Sdn Bhd and UEM Land. Other developers at Cityscape Asia include Rippleside Quay, Thai Royal Residence and Gallant Venture Ltd.
One of the highlights of the event will be the Cityscape Asia 2009 Awards ceremony and gala dinner scheduled to be held on the first night followed by a networking cocktail party on the second night. PETALING JAYA: Mah Sing Group Bhd will be building up its commercial property portfolio to ride out the soft demand for residential property that is expected to last until at least early next year. Leong ... 'We may go into real estate investment trust later on'. President and group chief executive Datuk Sri Leong Hoy Kum expects commercial projects to contribute to about half of the company’s sales target of RM450mil and 40% of the company’s revenue for the financial year ending Dec 31. Leong said Mah Sing intended to use its potential war chest of close to RM900mil to expand its landbank for more commercial and residential projects that fit its business model of quick project turnaround. “We see good demand for commercial properties, especially purpose-built buildings in prime locations and lifestyle commercial developments, including well-planned business parks, offices, shops, and retail space,” Leong told StarBiz. He said most of the Grade A offices and shop offices in good locations were doing well and he expects prices to start climbing next year. Currently, office space is fetching between RM1,000 and RM2,000 per sq ft while shop offices are priced around RM500 to RM1,000 psf. “At the moment, we see good demand for commercial properties, especially purpose-built buildings in prime locations and lifestyle commercial developments, including well-planned business parks, offices, shops, and retail space,” he said. Mah Sing has five ongoing commercial projects in Kuala Lumpur and Penang worth a total gross development vaue of RM2.2bil. These projects will take between three and seven years to complete. The Icon Jalan Tun Razak comprises two blocks of Grade A office space in the heart of Kuala Lumpur with a gross development value (GDV) of RM430mil. With approximately 500,000 sq ft of net lettable area, it is slated for completion in the middle of this year. The office blocks have been sold to Kuwait Finance House and Kooperasi Felda. The second in the Icon commercial series, Icon Mont’ Kiara worth RM305mil, will also be sold en bloc. Southgate Commercial Centre in Kuala Lumpur comprises five blocks of office and retail space with 599,000 sq ft of net lettable area. Three of the blocks are available for sale on strata basis, with retail lots ranging from 535 sq ft to 2,105 sq ft at average price of RM1,100 psf, and office suites from 587 sq ft to 1,712 sq ft at RM550 psf. Close to 90% of the office and retail space in the three blocks has been sold for RM152mil and the RM458mil project is on track for completion by 2011. Starparc Point in Setapak, Kuala Lumpur, on five acres, will comprise mainly 24 three-storey shoplots and 22 units of six-storey shop offices for a GDV of RM125mil. It will be launched next month for completion in 2012. In Penang, the commercial precinct of Southbay Penang is an integrated commercial hub within a resort-like setting. Comprising fine-dining restaurants, retail outlets, service apartments and hotel suites, the project will have a GDV of RM911mil. The project will be open for private preview around the year-end or the first half of next year. It is expected to be completed within five and seven years from the project’s launch by the first half of next year. Meanwhile, the residential precinct of Southbay Penang on 54 acres will have 284 super-link homes priced from RM795,000 and 76 bungalows priced from RM3.7mil. The residences will be launched for sale next month and will have total GDV of RM518mil. Earlier, there had been concerns the property development industry would be driven to the boondocks, including fears of fire-sales in the secondary market, but the catchy marketing programmes of developers have re-built business conditions and consumer confidence. 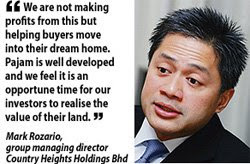 PROPERTY and leisure group Country Heights Holdings Bhd will speed up development to build bungalows at its College Heights project in Pajam, Negri Sembilan, to pave the way for new launches worth some RM400 million from end-2010. The 444ha project was launched in 1995 and Country Heights had allocated 384ha for 2,200 bungalow lots and the rest to build a university campus, shop-offices and a commercial centre. Although it sold 1,800 lots for RM300 million in the 1990s, buyers had been reluctant to build their bungalows due to the Asian financial crises. Year to date, only 30 bungalows were built, of which 20 are owner occupied. Country Heights has launched the "build your dream home" campaign in an attempt to get buyers to develop their lots. Its group managing director Mark Rozario said the company has appointed contractors, architects and security providers to help buyers build the bungalows at 30 per cent cheaper than market price. But to do that, it would need 100 buyers to agree before the contractors and the service providers embark on buying construction materials. "The more materials their buy, the lower the building costs," Rozario said at a recent media briefing in Seri Kembangan, Selangor. Rozario added that by lowering building costs, the contractors will be able to construct a single-storey bungalow for as low as RM177,000 and a double-storey bungalow from RM300,000. "We are not making profits from this but helping buyers move into their dream home. Pajam is well developed and we feel it is an opportune time for our investors to realise the value of their land," he said. Following the development of the bungalow lots, Country Heights will launch shop offices and the hypermarket and perhaps develop the university campus by the end of next year. Pipeline launches may include a hospital and a hotel, among others. Rozario said Country Heights will not be launching new projects this year in the Klang Valley due to the unfavourable market condition. The company will only embark on new launches at the end of next year. Hence, Rozario said, he does not expect growth in the company's net profit and revenue this year. "We are facing a challenging time but having said that, we have a property inventory of RM500 million. So we are sitting on very significant unrealised profits and some will be recognised this year," he said. For fiscal year ended December 31 2008, Country Heights posted a net profit of RM9.2 million on revenue of RM241 million. KUALA LUMPUR: Loh & Loh Corporation Bhd's unit Green Heights Developments Sdn Bhd (GHD) is acquiring a 8.66-acre freehold land from Bina Goodyear Bhd's wholly-owned Greater Heights Development Sdn Bhd for RM27 million cash. In an announcement to Bursa Malaysia today, Loh & Loh said the proposed acquisition was in line with the strategy to diversify its business into property development via GHD and to reduce its exposure to the construction industry. Loh & Loh said it was considering developing high-end properties as the area, which is situated in Sri Damansara, Selangor, had a mature market that was ready to upgrade into larger housing units such as semi-detached and bungalow homes. The company said it would finance the purchase via internal funds or bank borrowings. "The breakdown of the source of funding has yet to be ascertained," it said.